There are ten principles of Fair Trade listed by WFTO, each one has to be understood and adhered to for a group to be classified as a fair trade organisation and to be eligible to label their products. In this series of Fair Trade Fact Sheets MESH is trying to highlight the ten principles and illustrate the types of compliance and indicators that are required for each principle. This month the Fact Sheet is about Principle 4 - Payment of a Fair Price a subject debated much over the decades. 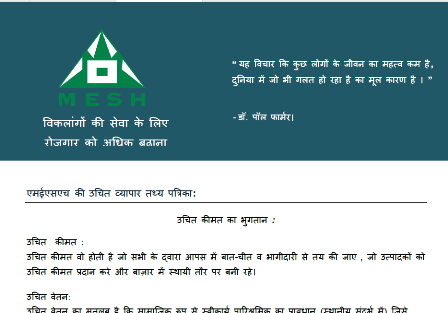 MESH is circulating these to our producer groups in English and Hindi and posting them on this website. Please feel free to share them with other people so that more people will come to understand about Fair Trade.